This handsome American BULLDOG mix is a former family pet who has lived with kids. He is gentle and well behaved, a calm boy who prefers a quieter home. Loud noises and screaming stress him out, and he will shake and quiver. Debo is house trained, but hates the crate. He is very well trained, the list of words that he knows can fill up a page, A TOTALLY AMAZING DOG THAT KNOWS HAND SIGNALS AS WELL. Deebo needs an experienced adopter, he has separation anxiety, who won't be anxious, when this boy is sooo focused and attached to his family, all of a sudden finds himself alone without any.His rescue has abandoned him, and told his current home to put him down. How can you do that to a dog with such outstanding abilities? 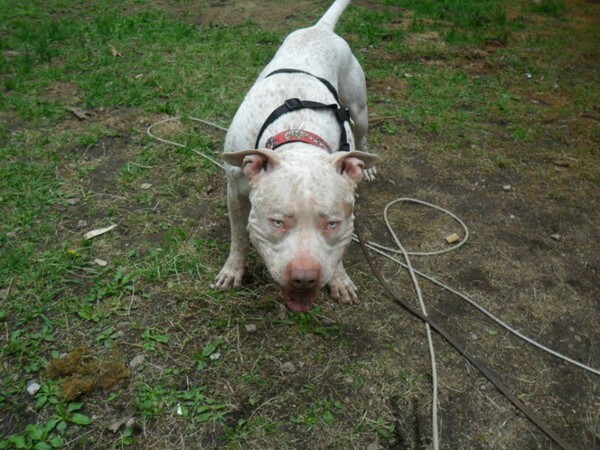 Deebo has been bounced around so much that he needs to find some stabitilty and help with wih anxiety issues. Our friend Nancy Cross has taken it upon herself to get Deebo the help that he needs. We wont sugarcoat it. Deebo has severe separation anxiety, and is an escape artitst. How can you keep a dog by your side for 24 hours a day? You can't its impossible. Nancy has emailed and spoke to a bunch of rescues, and they have recommended an escape proof kennel which will cost $500. At this point, it seems that is what will save Deebo's life, to keep him safe, and to make it possible for anyone to foster or adopt him, to give him time to decompress, to take it slow, and to feel safe and to trust again. It's a long road, but our friend Nancy does not give up easily. Deebo has her heart, and so we must help her and Deebo. How can you resist that face? matched by his sweetness and his abilities. Please help us help Deebo. We need to purchase this escape proof kennel for Deebo, so that Deebo does not end up hurting himself. We have set up a fundraiser for $800 to help Nancy purchase this kennel, and to help her with the expenses she has incurred, in finding options for Deebo. Thank you so much for reading Deebo's story, and for wanting to help.